One of my most popular recipes, this crispy sour-salty cabbage can be stored in the marinade in the refrigerator for a long time. Add as much hot pepper as you like. Great alternative to a salad for a party or picnic. Chop the cabbage into then strips. Clean the carrots, cut into thin strips or circles. Wash the bell pepper and clean the seeds, then cut into strips. Finely chop the garlic or cut into thin slices. Keep the chili peppers whole. Mix in a saucepan the vegetable oil with water, vinegar, salt, cayenne pepper and sugar. Stir and bring the marinade to a boil, remove from heat and let cool slightly. 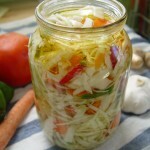 Mix the vegetables and put into a large glass jar. Pour in the warm (not hot! 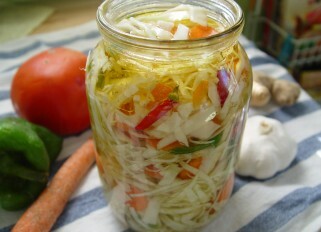 )marinade, cover with lid and place in a refrigerator. A day or two later the cabbage is ready.